With new innovative technology, Ami Bentov, founder of Jerusalem Nano Bible, has literally reinvented the Bible. Printing the entire manuscript on a 5mm by 5mm surface, the appropriately named Nano Bible is the smallest Bible printed onto a single surface. 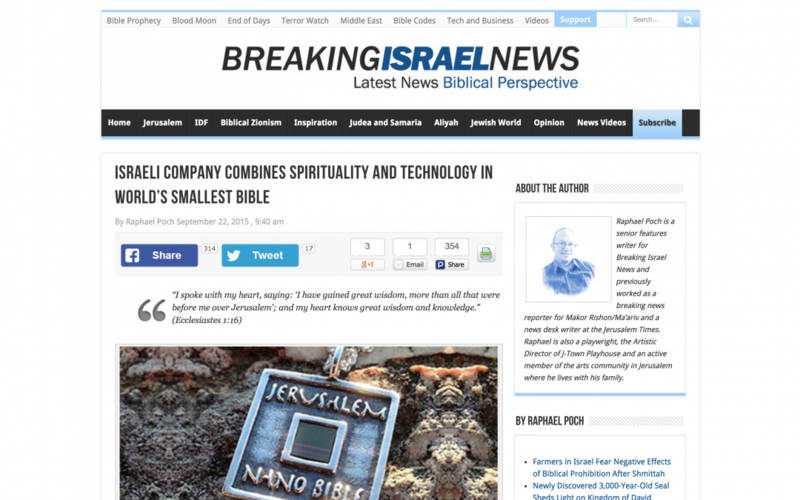 Bentov believes that the nano Bibles, which have been in circulation since 2013, are a perfect union of Israel’s spirituality and its reputation as a high-tech haven. He was inspired by the uniqueness that modern-day Israel represents as a place of both technological advancements and a meeting point of faiths. Israel is a place of contrasting belief systems, where both prayers for peace and the threat of war are almost constant. It was this idea that motivated Bentov to initiate the project and to develop a product which will convey a message of comfort for all faiths. With Israel’s cutting-edge nanotechnology, merging the spirit and scientific prowess of Israel has never been easier. The invention has seemingly paid off for Bentov and the company, as they were recently nominated for the Guinness Book of World Records for creating the world’s smallest Bible. The Nano Bible can be mounted onto decorative settings and precious metals, making it ideal to fit onto jewelry and keepsakes. Pendants, watches, bracelets and lockets with Nano Bibles are now available in stores. The Nano Bible has both New and Old Testaments available, and comes in a variety of languages. Each letter of the Bible measures in at 0.18 microns which makes it unreadable to the naked eye. To read this Bible one would need an electron microscope to zoom in to the 1000x level. To put into perspective just how small each letter of the Nano Bible is, one human hair is between 80,000 to 100,000 nanometers wide. A letter in the Nano Bible is only 600 nanometers wide. It is only 10 times greater than the width of a UV wave, and 24 times greater than the width of a strand of DNA. Bentov is hopeful that his company’s work can change the way people think about the Bible worldwide. “If the entire world spoke for one minute a day, or a few minutes day, about the Bible, whether they are wearing it, or just have it with them, those few minutes are creating a positive few minutes in their lives that would otherwise not be there,” he said.